Today, Nevada Donor Network (NDN) will kick off National Minority Donor Awareness Week with a clothing drive to benefit our community’s underserved students. The clothing drive will serve as a "pay it forward" effort, which ties into the mission of encouraging more people to “pay life forward” and register as organ, eye and tissue donors, in addition to building goodwill within the community. 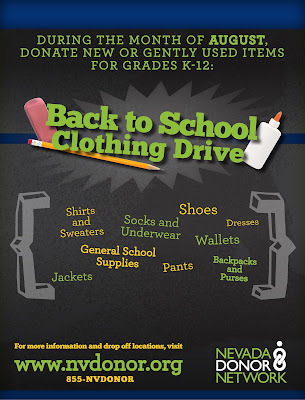 Nevada Donor Network is collecting new and gently-used clothing of all sizes for children in grades K-12. Items needed include pants, shirts, tennis shoes, sweaters, jackets, underwear (new only), and socks (new only). Nevada Donor Network is teaming up with businesses and partner organizations across the valley that will serve as drop off locations for items, including Funeraria Casa de Paz, National Title Company, Rockin’ Jump, Sambalatte, Grand Canyon Development Partners, and Phase 1 Sports to name a few. A complete list of locations is available at www.nvdonor.org. After all items have been collected, the organization will host a shopping event at a local partner school, inviting parents to come choose items for their children. The event will also serve as a health fair featuring vendors with general health and wellness information. Attendees will also have the opportunity to register to become organ, eye and tissue donors and learn more about the critical need for more multicultural donor registrations. Based on data from the United Network for Organ Sharing (UNOS), there were 9,097 deceased donors in the United States in 2015. 16.3% were African American, 13.6% were Hispanic, 2.5% were Asian and 1.1% were Multiracial. Many health conditions that lead to the need for a transplant, such as diabetes and hypertension, occur in greater numbers among multicultural populations. 58.1% of individuals on the national organ transplant waiting list are multicultural; however only 34.3% of deceased donors in 2015 were of multicultural descent. Nevada ranks 45th in the nation with just 41% of its 18+ population being registered donors. During National Minority Donor Awareness Week, Nevada Donor Network is asking for those of multicultural descent to visit www.nvdonor.org to learn the importance of donation in multicultural communities and register as organ, eye and tissue donors.